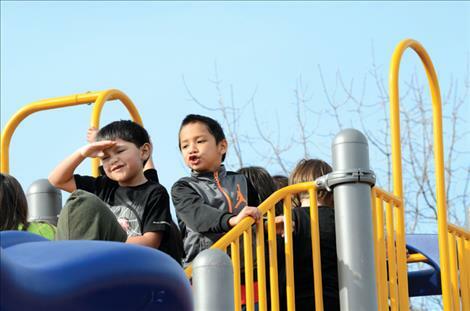 Karen Peterson photo Schoolchildren enjoy new playground equipment at St. Ignatius Elementary School. Children grin from ear to ear while playing on new equipment in St. Ignatius. ST. IGNATIUS – It used to take two minutes to line the elementary kids up after recess – now it takes five. The kids are busy twisting around a yellow pole, going up the solid wavy ladder and back down one of the six blue slides on the new playground equipment. Superintendent Bob Lewandowski explained that the equipment is designed for children of all abilities with safety in mind, and that costs money — about $62,000. 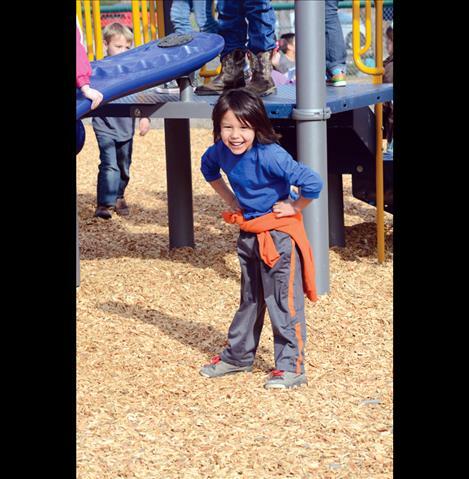 The majority of the school’s budget goes towards academics, which left nothing for the playground, so the community helped make the project happen. 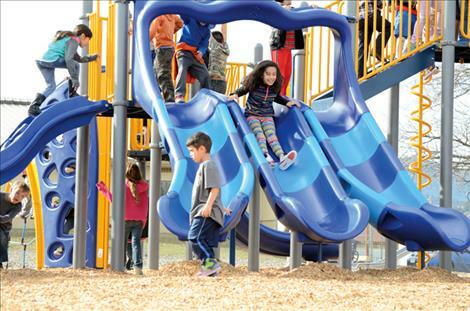 The Mission Possible Playground Committee held several fundraisers over the past four years to help fund the project, including a penny drive, pizza sales and a walk-a-thon. The kids are excited about their new equipment. Lewandowski hopes to see the community pull together again for the next phase of the project and he already has a matching grant available. People can make donations by calling the school at (406) 745-3811 or online through a link on the school’s website.